Getting the Google Adwords data into Pardot from your website is an absolutely crucial component of a holistic and seamless approach to digital marketing for your business. 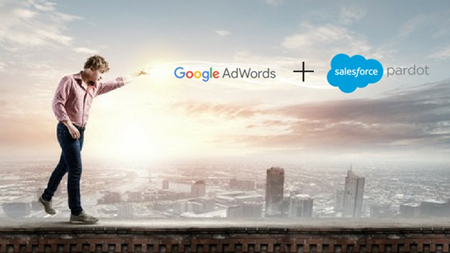 Connecting your Pardot with your Google Adwords data leads to excellent benefits for your overall marketing and sales strategy. You’ll be able to connect once-anonymous visitor behavior with an actual identity in your system. You’ll then be able to track behavior and segment your marketing with exceptional accuracy. And most important—you’ll be able to make a tangible, quantifiable relationship between your digital efforts and your closed sales. This connection between data and marketing automation is an essential advantage of modern digital marketing. There are two main ways to connect your Pardot system with Google Adwords: the Google Analytics Connector and the Google Adwords connector. Both have different advantages and challenges, but either can be used for a positive result. Recently, we spoke with Michel Kayyal, Marketing Architect at Invado Solutions and all-around marketing automation guru, to dig a little deeper into these Adwords tracking and connection options. The Google Analytics Connector facilitates and simplifies the movement of data throughout Google Analytics, Pardot, and Salesforce. This system sends information from Google Analytics Keyword Tags (campaign name, medium, source, content, and term) in URLs to Pardot. The tags can be synced to your CRM once they are in Pardot. Using the CRM reporting features, you can run custom analysis on all of these tags. There are a few limitations and challenges to keep in mind should you choose the Google Analytics Connector. Unfortunately, you can’t use the auto-tagging feature. You’ll need to disable the auto-tagging feature, then manually add your parameters using Google’s URL builder. The Google Adwords Connector is a great option, especially if you heavily utilize Google’s paid search functionality. The ability to tie your Adwords cost data to opportunity data from your CRM can help you keep track of your true cost per qualified lead, as well as search engine marketing ROI. Management of your Adwords will still need to be directly through Google, but all of the insight into your campaigns will be available in Pardot. You also won’t need to disable auto-tagging to use the Adwords connector. The main drawback is that the Adwords connector does not support My Client Center (MCC) accounts. You can still use your MCC accounts, but you’ll need to set up a connector for each child account. Linking your Adwords to your Pardot system is a great step towards getting the results you want. If you’re ready to go even further into Pardot and Salesforce success, we’re ready to get you there. Get in touch and let’s make it happen. Invado Solutions has been at the forefront of marketing technology and marketing automation since 2003. Our founder, Christopher Doran, was co-founder of an early market leader in marketing automation software, Manticore Technology. As Vice President of Marketing at Manticore, not only was he responsible for harnessing the power of marketing automation, he developed cutting-edge thought leadership on how to use marketing automation to drive true business value. In 2013, he realized that companies were struggling to capture value out of marketing technology and Invado Solutions was born. Today, Invado is a virtual team of marketing executives and technologists with a passion for marketing and technology. I guess you could say that we’re creative, techno-engineers that love helping companies succeed.